TOKYO — For his last time, Japan’s Emperor Akihito addressed a memorial service Wednesday marking the end of World War II. Once again, he expressed “deep remorse” for the war. It was in keeping with what by all appearances has become a mission for Akihito over his 30-year reign: to make amends for a war fought in the name of his father, Hirohito. The 84-year-old monarch is set to abdicate next spring. 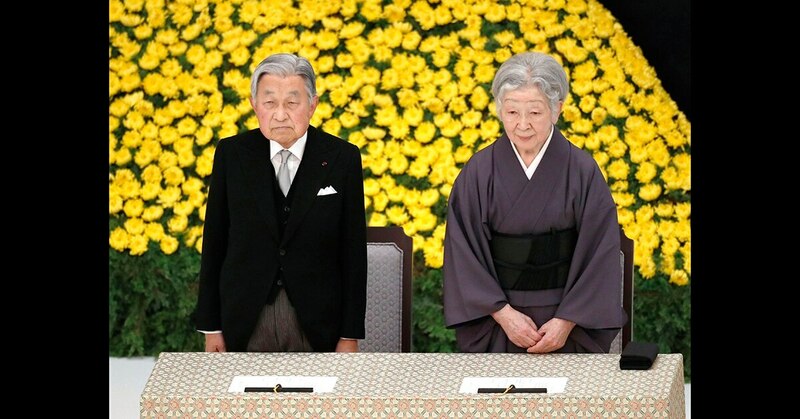 "Reflecting on our past and bearing in mind the feelings of deep remorse, I earnestly hope that the ravages of war will never be repeated," Akihito said in a two-minute speech on the 73rd anniversary of Japan's surrender. The atomic bombing of Hiroshima on August 6, 1945, has been the subject of numerous books and articles since that time. However, the story of the second mission, which bombed Nagasaki, has received less attention. As emperor, he has made unprecedented visits to the Philippines and other Pacific islands conquered by Japan early in World War II and devastated in fierce fighting as the U.S.-led allies took them back. Though Akihito has avoided a direct apology, he has subtly stepped up his expressions of regret in recent years in carefully scripted statements on the war. His words have taken on greater importance as Prime Minister Shinzo Abe has sought to move Japan beyond its troubled past since coming to power in December 2012. Opponents of Abe's policies have grabbed onto the emperor's statements as a counterbalance to the prime minister's push to revise Japan's war-renouncing constitution and build up its military. 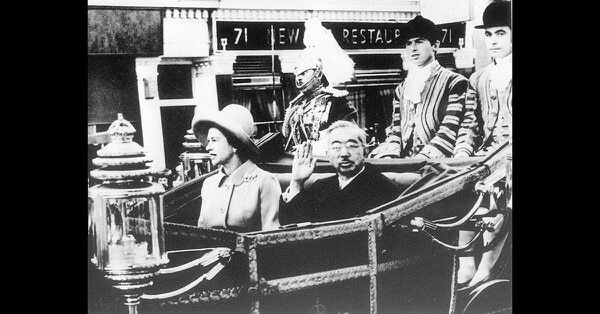 Akihito's World War II-related trips and pronouncements form part of a broader effort to bring the royal family closer to the public. In so doing, he has won over pacifists, leftists and other critics of the emperor system in a way his father was never able to do. Hirohito, who was worshipped as a living god until the end of the war, remains a controversial figure even today, with historians still debating his responsibility for the war. During his father's reign, Akihito himself was almost hit by a Molotov cocktail on a 1975 visit to Japan's southern Okinawa island, where tens of thousands of civilians died in intense fighting near the end of World War II. He has since visited the island 10 times. Okinawans warmly welcomed him and his wife Michiko earlier this year in what was likely his last as emperor. Akihito was 11 years old when he heard his father's voice announcing Japan's surrender on the radio on Aug. 15, 1945. During the subsequent U.S. occupation of Japan, he was tutored in English by Elizabeth Vining, a Quaker, an experience that experts say gave Akihito his pacifist and democratic outlook. The Doolittle attack generated more, and more violent, ripples than once thought. Though Hirohito hardly changed the wording of his Aug. 15 message for a quarter century, Akihito's has evolved since he became emperor after his father's death in 1989. On the 50th anniversary of the war's end in 1995, he expressed for the first time the hope that the same tragedy would never be repeated. The same year, then-Prime Minister Tomiichi Murayama acknowledged Japan's wartime aggression and made a landmark apology to victims in the rest of Asia. His successors expressed remorse to other Asian countries until Abe dropped them and any reference to aggression in his Aug. 15 remarks beginning in 2013. He has pledged that Japan will not repeat the devastation of war, and did again Wednesday. Abe also sent a religious offering to a Tokyo shrine that honors the war dead, including convicted war criminals. He has avoided visiting the shrine since 2013 in a bid to avoid overly angering China and South Korea, which see the Yasukuni shrine as a symbol of Japan's military aggression. In his 70th anniversary address in 2015, Akihito started using the expression he used Wednesday, stronger words than he had used previously. The contrast with Abe captured media attention, with the prime minister portrayed as a nationalist pushing for a stronger military versus a pacifist Akihito. Abe wants Japan to stop dwelling on the past, while the emperor doesn't want his country to forget it. Akihito visited China early in his reign and has traveled to some of the harshest World War II battlefields in the Pacific. His 2005 visit to the U.S. territory of Saipan was hailed as a statement of his desire to be part of the postwar healing process. Akihito traveled to the western Pacific nation of Palau in 2015 and the Philippines in 2016. While his Aug. 15 address is always short, Akihito has expressed his thoughts about the war more clearly in annual birthday remarks and on overseas trips. He has repeatedly stressed the importance of studying history and passing it down to the next generations. "Now that the memories of the war have started to fade, I think it is extremely important for everyone to study time and again the course of history Japan has followed and to reflect on peace," he said in his 2011 birthday address. His son, Crown Prince Naruhito, has largely echoed his father's pacifist stance, but it is unclear if the first postwar-generation emperor will be able to strike a similar chord with today's younger Japanese. This story has been corrected to show Akihito visited Saipan in 2005.